NASA/Dana Berry, SkyWorks DigitalThis image depicts three hot blobs of matter orbiting a black hole. If placed in our Solar System, this black hole would appear like a dark abyss spread out nearly as wide as Mercury’s orbit. Don’t tell “Interstellar” director Christopher Nolan this, but black holes don’t exist, according to a scientific paper published earlier this year. Black holes are some of the most extreme environments in space ever conceived by science and are also one of the most gripping visual effects in Nolan’s latest blockbuster hit. But according to astrophysicists Laura Mersini-Houghton and Herald P. Pfeiffer, they aren’t real. The theory got a fair amount of push back from the astrophysics community who is not willing to accept the pair’s unorthodox results. According to what we know about gravity through physics: Black holes are the only thing that’s left after stars that are 20 to 30 times more massive than our sun explode in a brilliant light show called a supernova. The aftermath is an extremely dense core that has an immense gravitational pull. The pull is so great that nothing escapes, not even light. As a result, no one knows what a black hole looks like or exactly what’s inside that ominous black abyss. Scientists even suspect that our laws of physics break down at the very center, a phenomenon called the singularity. TheVendor101Animation of a black hole where nothing escapes. 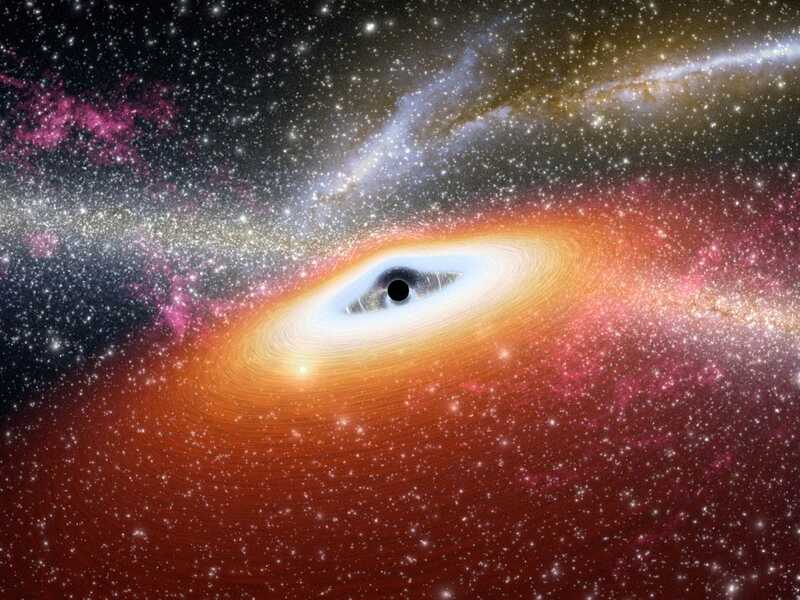 The only way to get a better understanding of black holes, therefore, is through computer models that simulate the process of how a massive star explodes and the remaining core collapses in on itself, creating a black hole. But recently, Mersini-Houghton, from the University of North Caroline at Chapel Hill, and Pfeiffer, at the University of Toronto, discovered something surprising when working out their stellar-collapse models: black holes can’t form, which then led them to the astounding conclusion that black holes don’t exist. The astrophysicists’ theory hinges on a phenomenon that Stephen Hawking first discovered in 1974, which claims that black holes don’t just gobble up matter, they also vomit some of it back out into space in what experts call Hawking radiation (shown below). And the smaller the black hole, the more intense and voluminous the vomit action, Hawking theorized. stevebd1Animation of a black hole emitting Hawking radiation. If a collapsing star were to let off Hawking radiation, it just might disintegrate into nothing before it transforms into a black hole, according to Mersini-Houghton and Pfeiffer. Why? Because a collapsing star grows ever more dense if, and only if, its mass stays the same. A star that is losing mass as it collapses could still grow denser but at a much slower rate. And if the star loses too much mass, then it will never achieve the density necessary to become a monstrous black hole and instead will evaporate into nothingness. 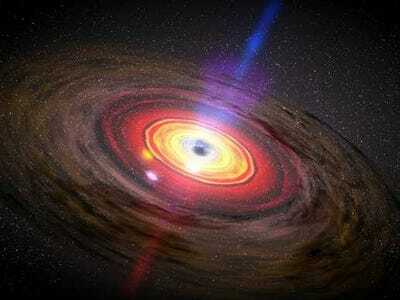 NASA/JPL-CaltechOne of many artist renditions of a black hole. The problem with Mersini-Houghton and Pfeiffer’s claims are that astronomers have decades-worth of compelling evidence for the existence of black holes — in particular, a supermassive black hole at the center of our Milky Way galaxy. The Hubble Space Telescope, in 1994, measured the speed at which material was whirling around an unseen mass at the Milky Way’s center. Although it appeared like nothing was there, there was obviously something creating the gravity around which the galaxy is whirling. And the speed at which it was orbiting suggested that the invisible something was three billion times the mass of our sun that is concentrated into a space smaller than our solar system. If what Hubble saw is not evidence for a black hole, Mersini-Houghton and Pfeiffer do not suggest what else it might be. If they’re right, and black holes do not exist, then it will mean back to the drawing board for theoretical astrophysicists everywhere. That is a very big if, however, according to according to physicist and science writer Matthew R. Francis. “I’ll say straight out: I think these results are wrong. However, seeing why is important, and part of the process of science,” Francis wrote in an article for The Daily Beast titled “Black Holes Exist. So Does Bad Science“. Francis isn’t the only one pissed off.